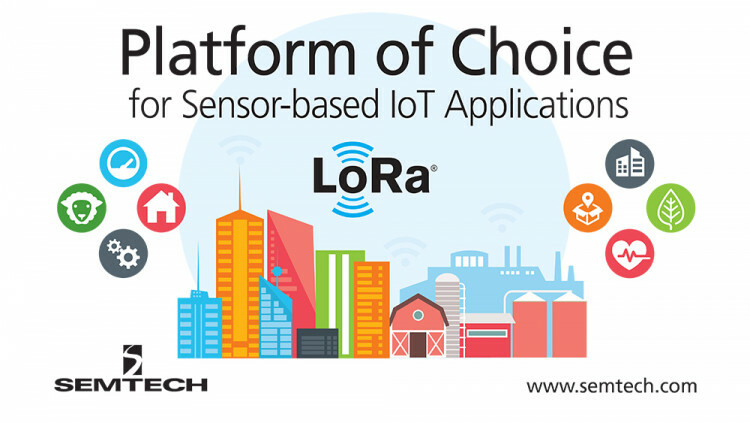 Semtech Corporation (Nasdaq: SMTC), a leading supplier of high performance analog and mixed-signal semiconductors and advanced algorithms, announced its LoRa® devices and wireless RF Technology (LoRa Technology) is positioned as the de facto platform for Low-Power Wide-Area Networks (LPWAN) used in supporting thousands of real-world IoT applications. By the end of 2017, Semtech also expects the number of long-range, low-power wide area networks based on the LoRaWAN™ protocol to exceed 65 countries and anticipate the number of deployed macro cell gateways to reach 65,000 equating to a sensor capacity of several hundred million sensors, and ultimately, enable connectivity of billions of LoRa-based sensors within a few years. With this rapid evolution and adoption of an open standard and deployment worldwide in over 65 countries, LoRaWAN enables a new generation of IoT use cases that can be deployed quickly and potentially disrupt existing industries including smart cities, smart building, smart supply chain and logistics, smart metering, and smart agriculture. Vertical deployments range from improving a smart city’s operation efficiencies to monitoring valuable airport equipment across multiple locations to providing public safety to the community. All statements contained herein that are not statements of historical fact, including statements that use the words “is positioned as,” “expected to,” “expects,” “ultimately enables,” “can be deployed,” “potentially disrupts,” “ready to enable,” “designed to,” or other similar words or expressions, that describe Semtech Corporation’s or its management’s future plans, objectives or goals are “forward-looking statements” and are made pursuant to the Safe-Harbor provisions of the Private Securities Litigation Reform Act of 1995, as amended. Such forward-looking statements involve known and unknown risks, uncertainties and other factors that could cause the actual results of Semtech Corporation to be materially different from the historical results and/or from any future results or outcomes expressed or implied by such forward-looking statements. Such factors are further addressed in Semtech Corporation’s annual and quarterly reports, and in other documents or reports, filed with the Securities and Exchange Commission (www.sec.gov) including, without limitation, information under the captions “Management’s Discussion and Analysis of Financial Condition and Results of Operations” and “Risk Factors.” Semtech Corporation assumes no obligation to update any forward-looking statements in order to reflect events or circumstances that may arise after the date of this release, except as required by law. Semtech, the Semtech logo, and LoRa are registered trademarks or service marks, and LoRaWAN is a trademark or service mark, of Semtech Corporation or its affiliates. *Information based on IHS Markit, Technology Group, Low Power Wide Area (LPWA) Market Report – 2017. Information is not an endorsement of Semtech Corporation. Any reliance on these results is at the third party's own risk. Visit technology.ihs.com for more details.